This 11 song CD of Nightmare Before Christmas lullabys was produced by Baby Rockstar. It features instrumental, simplified, soft and sweet versions of the classic NMBC songs. You can also listen to the entire album on YouTube! 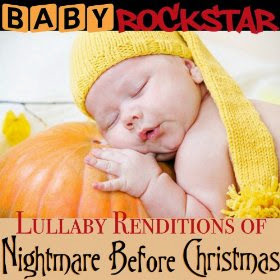 Baby Rockstar's Nightmare Before Christmas lullaby CD is also available on eBay.